“As important as it is to leave home every day with a full charge on your cell phone, it is far more important to be fully charged spiritually. Every time you plug in your phone, use it as a reminder to ask yourself if you have plugged in to the most important source of spiritual power – prayer and scripture study, which will charge you with inspiration through the Holy Ghost”. Along with this idea, I thought it might put a little note on my charger, as a verbal reminder to “Plug In Spiritually”. I know that when I have taken the time to come closer to the Lord, through prayer and scripture study, He helps me with whatever I might face in the day, whether it is having patience with my son, understanding concepts in school, or just having enough time to do everything. Let’s get started with this bread recipe. 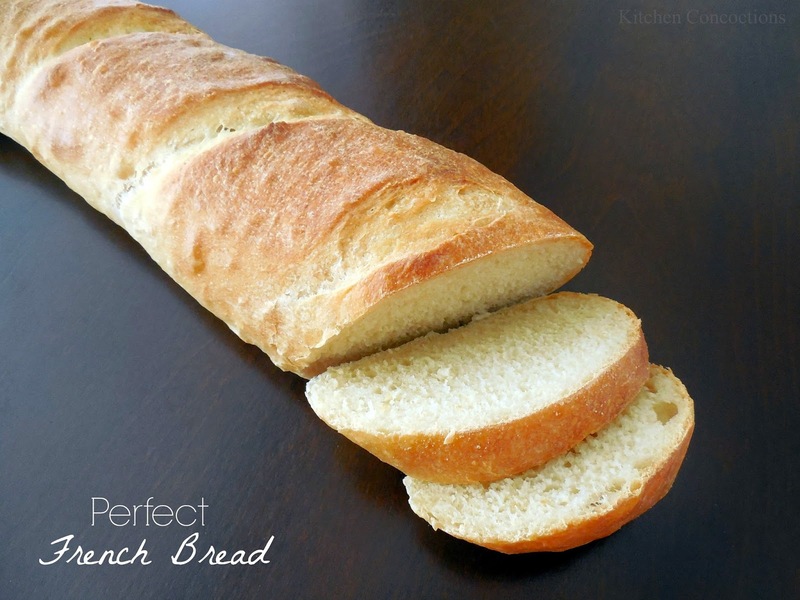 This was not my first attempt making French Bread, but it was the perfect attempt. Actually though, only one loaf was perfect, but I will explain why. I got this recipe from The Steamy Kitchen, and I chose it because the bread in her picture was perfectly golden brown. Making the bread according to her recipe was easy enough, but as I baked the first loaf I watched as everything went wrong in the oven. The shallow slits that she suggested I put in the bread were not nearly enough, and the steam blew out the side. Little bubbles at the surface also began expending giving my bread all kinds of wart-like growths on the crust. Finally, my loaf came out as white as the unbaked dough. This was not at all how I planned for my French Bread to turn out. I made some quick adjustments to the second loaf and watched in anticipation as I baked it. This time, it was perfect! I amazed myself with how beautiful the loaf looked (keep in mind it all came from the same batch of dough). So now I am here to share the secret with you. It’s not a secret really, but the little details make a huge difference! First, when you make slits in your dough – to let the steam out – they must be at least 1/2 inch deep. This allows the steam from the center of the dough to come out the slits, rather than out the side. Second, if there are any bubbles on the surface of the bread you need to carefully pop them. You don’t want to make big gouges on the surface of the bread, but if you leave the bubbles you will have a wart-like crust. Finally, you must brush the dough with egg whites and milk. This allows the crust to brown. Without it, your crust will stay white, like the dough, because there is nothing inside the dough (eggs, milk, oil, butter) to do much browning. *Form the bread as evenly as you can, and carefully pinch the seams closed so that the gas from the yeast will make the bread rise up smoothly. *Bake the bread on a preheated pizza stone or cast iron dutch oven. *Put a metal baking dish in the oven to preheat with the pizza stone. When you put the bread in the oven, pour 1/2 cup water into the metal dish and quickly close the oven door. This creates steam that will help make the crust on the french bread. Put all the flour in a bread mixer except for 1/4 cup. Put the yeast on one side of the flour and the salt on the other side. Pour the warm water into the bowl as you begin mixing (I use the dough hook attachment). Mix on low until the dough begins to form. Mix the dough for 2 minutes (if you are doing it by hand then you will need to mix it for 6 minutes). Then stop mixing and let the dough rest for 5 minutes. Then mix the dough for 3 more minutes. Put the remaining 1/4 cup flour in a pile on a clean surface, and spread enough out to place the dough on. Remove the dough from the bowl and place it on the floured surface. Knead the dough by hand, adding small amounts of flour as needed, until the dough is smooth, satiny and forms a tight ball. Spray a large bowl with non-stick cooking spray. Put the dough in the bowl and turn the dough until the it is coated in oil. Cover the bowl with plastic wrap, place the bowl in a warm place and allow the dough to rise. Let the dough rise for 1 1/2 hours. 30 minutes before the dough is done rising, preheat the oven to 450 F. Put a baking stone or cast iron dutch oven on the middle rack to preheat in the oven, as well as a metal baking dish just below. Punch the dough down and divide it into two parts. Roll each ball of dough into a small rectangle (as long as you want your french bread to be). Fold the two long sides sides into the center of the dough. Do a “karate chop” down the middle of the dough, the long way. Fold the dough “hot-dog” style and tightly pinch the dough together, to keep it from coming apart. Pinch the ends in as well, to make them appear smooth. Roll the dough over, seam facing down. Mix the egg whites with the milk. Brush the surface of the dough with the egg white mixture. Cut 4-5 diagonal slashes into the dough, about 1/2 inch deep. Move the dough to the pre-heated pizza stone, leaving enough room between the two loaves to rise in the oven a bit. Before closing the oven door, put 1/2 cup of water into the metal baking dish, to create steam, and quickly close the door. Bake for 20-25 minutes, until the bread is golden brown. Remove the loaves from the pizza stone and place on a cooling rack. Allow the loaves to cool completely before cutting.